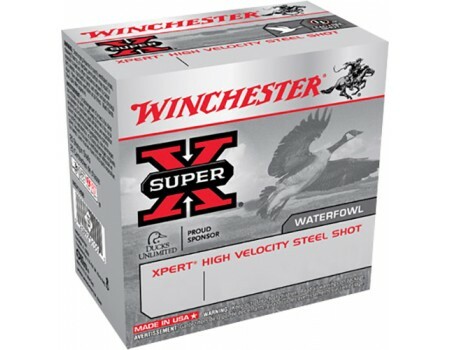 Winchester Super X Steel Shotgun Shells for Hunting. 12 Gauge, 2.75", 1-1/8 oz. Case price, 10 Boxes with 25 Shells/Box, 250 Shells Total. Super-X Waterfowl ammunition has provided exceptional quality and outstanding performance for all types of hunters and shooters who rely on its time-proven dependability backed by legendary excellence. High Velocity provides more energy per pellet for increased range and shorter leads, resulting in greater terminal performance and the Xpert steel shot is corrosion resistant with consistent patterns.